Members of Court House Quilters recently donated a portion of the proceeds from their May quilt show to The Backpack Program at Grace United Methodist Church. Left to right, Joyce Lott and Leslie Teeter of GUMC and quilters Bobbie Long, Beth Foster and Colleen Downing. 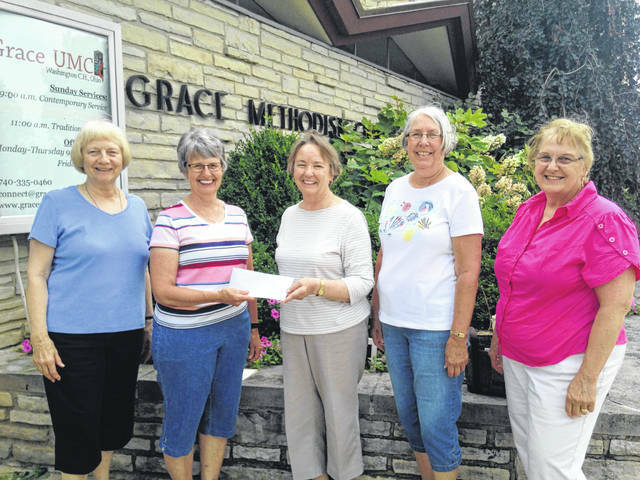 https://www.recordherald.com/wp-content/uploads/sites/27/2018/06/web1_Quilters2.jpgMembers of Court House Quilters recently donated a portion of the proceeds from their May quilt show to The Backpack Program at Grace United Methodist Church. Left to right, Joyce Lott and Leslie Teeter of GUMC and quilters Bobbie Long, Beth Foster and Colleen Downing.